Welcome to my site on Bipolar Disorder in Children! This site was built based on a long-standing interest I’ve had in Bipolar Disorder. After spending time working with a young Bipolar child, I realized I knew almost nothing about Bipolar beyond the stigma of "uncontrolled anger" and "unpredictable mood swings". I hope this site will help you learn as much as I have to challenge that stigma. 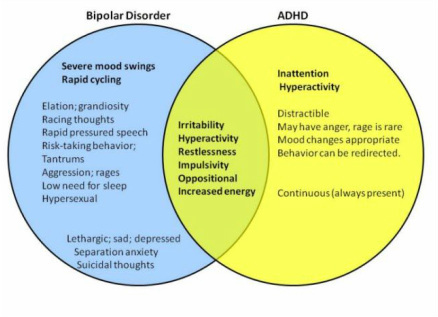 Little research has been done directly on pediatric Bipolar Disorder, but the disorder follows many of the characteristic patterns of adult Bipolar. It is characterized by unusual shifts in mood, between extreme highs called mania and extreme lows of depression, both of which occur outside of the normal “ups and downs” that everyone experiences naturally. Unlike most Bipolar adults, Bipolar children tend to have much more abrupt changes in mood, and cycle more frequently between mania and depression, with less time without symptoms between episodes. Symptoms of mania include inattentiveness, sleeplessness, euphoria and recklessness, and symptoms of depression include anxiety, irritability and thoughts of suicide. Bipolar Disorder is treated with a combination of psychotherapy and intensive medication regimens, which help to dull the extremes of each episode, but also come with various intrusive side effects. Bipolar Disorder significantly affects a child's daily life, and can impact the ability to succeed at school. Educators can be helpful in providing specific, tailored learning accommodations to students, especially in combating the effects of medication programs on learning, and can be a major support in helping these children succeed at school. Bipolar disorder is a brain disorder that causes unusual shifts in mood, energy, and activity levels. It can also make it hard to carry out day-to-day tasks, such as going to school or hanging out with friends. Symptoms are different from the normal ups and downs that everyone goes through from time to time. Bipolar I Disorder--defined by manic or mixed episodes that last at least 7 days, or by manic symptoms that are so severe that the person needs immediate hospital care. Usually, depressive episodes occur as well, typically lasting at least 2 weeks. Bipolar II Disorder--defined by a pattern of depressive episodes and hypomanic episodes, but no full-blown manic or mixed episodes. 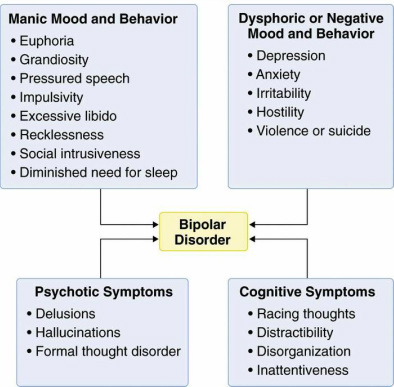 Bipolar Disorder Not Otherwise Specified (BP-NOS)--diagnosed when symptoms of the illness exist but do not meet diagnostic criteria for either bipolar I or II. However, the symptoms are clearly out of the person's normal range of behavior. Cyclothymic Disorder, or Cyclothymia--a mild form of bipolar disorder. People with cyclothymia have episodes of hypomania and mild depression for at least 2 years but do not meet the diagnostic requirements for any other type of bipolar disorder. Symptoms of bipolar disorder most often develop in the late teens or early adult years, but some people have their first symptoms during childhood. Learn more. Biological differences. People with bipolar disorder appear to have physical changes in their brains. Inherited traits. Bipolar disorder is more common in people who have a blood relative (such as a sibling or parent) with the condition. Environment. Stress, abuse, significant loss or other traumatic experiences may play a role in bipolar disorder. Learn More. Youth with bipolar disorder experience unusually intense emotional states that occur in distinct periods called "mood episodes." The extreme highs and lows of mood are accompanied by extreme changes in energy, activity, sleep, and behavior. Learn more. Unlike most adults, children who have pediatric bipolar disorder show abrupt mood swings, periods of hyperactivity followed by lethargy, intense temper tantrums, frustration and defiant behavior. This rapid, severe cycling between moods may produce chronic irritability with few clear periods of peace between episodes. Learn more. Bipolar Disorders in children are severe, highly comorbid, chronic, cyclical, and frequently relapsing biopsychosocial mood disorders of childhood and adolescence. The core symptoms of manic and depressive symptoms can be further exacerbated by the secondary problems of comorbidity; teacher, parent, and sibling stress; sleep disruptions; and time spent out of school. Learn more. Bipolar episodes occur outside the "normal" limits of mood, on either end of the spectrum. Behaving in risky ways more often, seeking pleasure a lot, and doing more activities than usual. When compared to their adult counterparts, children with Bipolar tend to display more rapid cycling of manic and depressive episodes, with less time in between episodes. There is not much statistical information to date specifically on the prevalence of childhood bipolar disorders. Cases more frequently display onset in later adolescence, with at least half of cases being diagnosed prior to age 25. Though the number of diagnosed bipolar cases in children is rising, there is a lot of controversy over whether these are misdiagnoses of disorders with overlapping symptoms, such as ADHD. Many individuals who are eventually diagnosed with Bipolar Disorder begin displaying symptoms as young children. There is often a lag in diagnosis because in children the symptoms displayed can also be attributed to disorders such as ADHD or anxiety. Lifetime Prevalence of Bipolar Disorder among U.S. adults. Bipolar Disorder is part of a larger category of Mood Disorders. 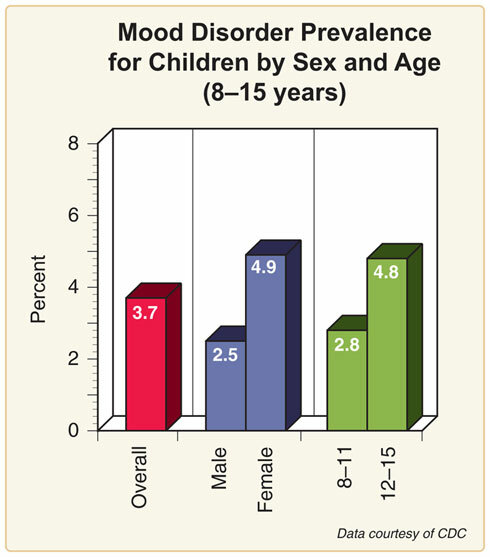 This chart shows the prevalence and distribution of overall mood disorders in children. It is difficult for clinicians to differentiate mania vs ADHD, and the real problem is comorbidity. ADHD is primarily a disorder of attention, not mood, with an onset before 7 years of age. It tends to be persistent, not episodic. The real problem is that many patients with mania--children and adolescents--tend to also have ADHD. Overlapping symptoms and high rates of comorbidity make diagnosing Bipolar Disorder in children more complicated. This adds to the controversy claiming that Bipolar Disorder is overly diagnosed when mistaking ADHD for a Mood Disorder. Bipolar Disorder in children often occurs alongside multiple other disorders, making diagnosis and treatment more complicated. There is no cure for Bipolar Disorder. However, through strategic treatment, the symptoms can be managed to lessen the impact on the individual's daily life. Treatments range from psychotherapy to intensive medication programs. Learn more about treatment options for Bipolar youth. Cognitive behavioral therapy, which helps young people with bipolar disorder learn to change harmful or negative thought patterns and behaviors. 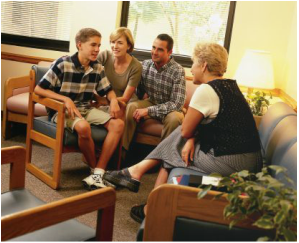 Family-focused therapy, which includes a child's family members. It helps enhance family coping strategies, such as recognizing new episodes early and helping their child. This therapy also improves communication and problem-solving. Interpersonal and social rhythm therapy, which helps children and teens with bipolar disorder improve their relationships with others and manage their daily routines. Regular daily routines and sleep schedules may help protect against manic episodes. Psychoeducation, which teaches young people with bipolar disorder about the illness and its treatment. This treatment helps people recognize signs of an impending relapse, allowing them time to seek treatment early, before a full-blown episode occurs. Psychoeducation also may be helpful for family members and caregivers. Mood stabilizers, such as lithium are usually the first choice to treat bipolar disorder. Lithium is approved for the treatment and prevention of manic symptoms in children ages 12 and older. In addition, lithium might act as an antidepressant and help prevent suicidal behavior. However, FDA's approval of lithium was based on treatment studies in adults, not children. Anticonvulsant medications, originally developed to treat seizures, are also sometimes used as mood stabilizers. They are not approved by the FDA for treating bipolar disorder in children, but your doctor may prescribe one on an "off label" basis. They may be very helpful for difficult-to-treat bipolar episodes. For some children, anticonvulsants may work better than lithium. Examples of anticonvulsant medications include valproic acid or divalproex sodium (Depakote) and lamotrigine (Lamictal). 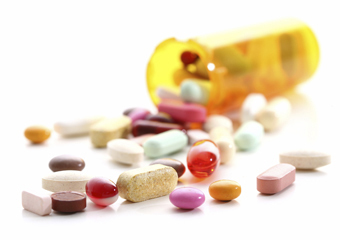 Atypical antipsychotics are sometimes used to treat symptoms of bipolar disorder. Those approved by the FDA to treat youth with bipolar disorder are risperidone (Risperdal), aripiprazole (Abilify), quetiapine (Seroquel), and olanzapine (Zyprexa). Short-term treatment with risperidone can help reduce symptoms of mania or mixed mania in children ages 10 and up. Some research has indicated that risperidone is more effective in treating mania in young children than other medications. Aripiprazole and quetiapine are approved to treat mania symptoms in children 10–17 years old who have bipolar I, while olanzapine is approved for use in children ages 13–17. Many of the symptoms of Bipolar Disorder, along with those associated with highly common comorbid disorders like ADHD and anxiety, have a tremendous impact on a child's performance in school. Although research is limited on academic functioning of children with EOBPSD, studies reported that 24% of children with EOBPSD repeated a grade, 13% had learning disabilities, 43% had special education placements, 58% received tutoring, and 30% and 42% had math and reading disabilities, respectively. Learn More. Impaired ability to plan, organize, concentrate, and use abstract reasoning. This can affect behavior and academic performance. Heightened sensitivity to perceived criticism. These children also are far more easily frustrated than a typical child. Crying for no apparent reason, appearing upset out of proportion to actual events, or seeming inconsolable when distressed. Side effects from medications. Medications may have cognitive effects or physically uncomfortable side effects that interfere with school performance. Other conditions, such as Attention Deficit/Hyperactivity Disorder (ADHD), which also may be present, compounding any learning challenges. Having one mental health condition does not "inoculate" the child from having other conditions as well. Learning disorders, which are often overlooked in this population. A child's difficulties or frustrations in school should not be presumed to be due entirely to the bipolar disorder. Many of the medications used to treat children with Bipolar can cause severe side effects that impact every day functioning. Many of these side effects affect a child's attention and physical comfort, and can seriously decrease a child's ability to learn in the classroom. Discreet assistance focusing or remaining on-task. An extra set of books to be left at home. Extended time on homework or projects and/or reduced homework. Assisting the student by helping them break large projects down into smaller pieces and conferencing with them on a regular basis to help them stay on schedule. Word banks or other devices to assist with retrieval of information from memory. This book is a resource for children that helps them understand their diagnosis and offers reassurance and comfort in stressful moments. The Storm in my Brain is a book that addresses how children with mood disorders may feel. It is a great resource for kids, their parents, and educators. This book is on the DBS Alliance's list for best books for parents with Bipolar children. Kid'sHealth.org - A site that is free of "doctor speak" and is for children and families to learn about all areas of health and growing up.